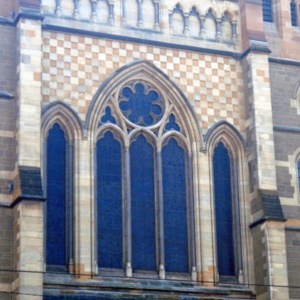 A close-up of the triple lancet window above the entrance doorway at St Paul’s Cathedral, Melbourne. The Cathedral’s mixture of early and late gothic styles is evident in this window; the flamboyant arches (each has a trefoil head rather than a simple point) are typical of the late gothic period, but the tracery and overall composition is not as ornate as would be seen in a decorated gothic window. The Cathedral’s distinctive chequered tiling surrounds the windows, capped by a blind arcade of lancet arches. St Paul’s Cathedral is located at the intersection of Flinders Street and Swanston Street in central Melbourne. It was built in a Victorian Gothic architectural style to the design of prominent English architect William Butterfield. The foundation stone was laid in 1880 and the Cathedral was consecrated in 1891. Butterfield oversaw the building remotely until 1884, when he resigned following disputes with the Church authorities in Melbourne. The remainder of the construction was supervised by well-known local architect Joseph Reed. Construction of the Cathedral’s three towers and distinctive neo-gothic spires began in 1926. They were designed by Sydney architect James Barr, and are not in keeping with Butterfield’s more modest original plans. 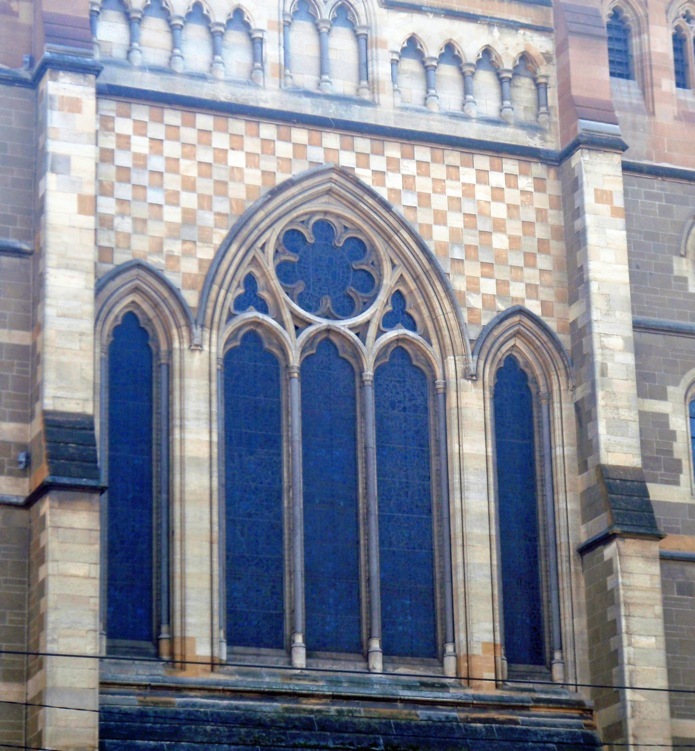 “St Paul’s Cathedral Triple Lancet Window, Melbourne,” Medievalism in Australian Cultural Memory, accessed April 25, 2019, http://ausmed.arts.uwa.edu.au/items/show/793.